The Experimental Lake Platform is available year round for collaboration on an on-going project (2018-2021), titled “New insights on the links between global changes, community structure and ecosystem stability (ECOSTAB)” funded by the French National Research Agency (ANR) leaded by Dr. Elisa Thébault and Dr. Gérard Lacroix. ECOSTAB aims to experimentally test the consequences of eutrophication and loss of top predators on food-web structure and stability of aquatic ecosystems in the experimental lakes of the PLANAQUA platform. Since 2015, half of the 16 artificial lakes (750 m3 each) have been regularly enriched with inorganic phosphorous (KH2PO4) and nitrogen (NH4NO3) to mimic possible water eutrophication due to anthropogenic activity (urban sewage, agriculture, industry., etc.) compared to natural oligotrophic conditions. In winter 2017, different fish communities of several species with or without big predators (pikes) have been introduced in the lakes in a four-factorial set-up crossed with the nutrient manipulation. The heterogeneity (littoral, pelagic and benthic habitats) and unusually large scale of these experimental systems recreate in this way real-size ecological communities with complex food webs. (i) monitor the main abiotic and biotic parameters and climatic variables of the lakes at fine temporal scales in order to characterize the temporal dynamic community structure and the ecosystem processes. (ii) Analyse the effects of nutrient enrichment and top predator loss on the variability of different ecosystem properties (physical/chemical, community responses, and lake metabolism) at different time scales and on the food web topological structure at different seasons. (iii) Investigate the effects of nutrient enrichment and top predator loss on the resistance and resilience of different ecosystem properties to extreme climate events. Every 3 months samples of phytoplankton, zooplankton and micro-zoo-benthos will be identified to the lowest possible taxonomic level, measured for body size and enumerated by microscopy. Macro-invertebrates will be sampled in the three main zones of lakes (lake sediment, littoral areas, and pelagic zones). Periphyton development and dominant pigment classes will be measured by fluorimetry. Fish populations will be accurately estimated using mark-recapture and removal methods. Once a month, we will measure total alkalinity, conductivity, turbidity, dissolved O2, dissolved nutrients: NO2–, NO3–, NH4+, PO43-, N-tot, P-tot, total Chlorophyll a and cyanobacteria, phytoplankton functional pigment groups as well as zooplankton biomass. Daily (every 2 hours) in each lake a set of automated sensors will record vertical profiles of water temperature, dissolved oxygen, depth pressure, pH, total chlorophyll and photosynthetically active radiation (PAR). A Campbell weather station automatically records (every 10 min) air temperature, air pressure, relative humidity, solar radiation, photosynthetically active radiation and rainfall of the platform. Four net radiometers and 4 anemometers, installed above the surface of 4 lakes, are connected to the weather station. – Migrations of zooplankton or macro-invertebrates in the experimental lakes. – Analyses of the interactions between the microbial loop and the classical food web (this may be investigated by flow cytometry with the instrument available in the laboratories of the PLANAQUA platform). – Relative importance of autotrophy and mixotrophy according to bottom-up and top-down control of communities. – Analysis of the carbon transfer between the different biotic and abiotic compartments of the lakes (for example bottom-up and top-down control of exchanges between pelagic, benthic and littoral areas). – Impact of changes of biotic conditions on the physicochemical characteristics of the lakes. – Evolution of the life history traits of organisms. – Role of macrophytes on ecosystem functioning. The approved users are welcome to participate to sampling campaigns as well as to data analysis and interpretation. Master and PhD students are welcome for training and will be supervised by the local team. Two artificial reservoirs (stocking and drainage lakes, 126 m x 15 m x 3 m deep, 4000 m3) are open all year round to new experiments that don’t imply chemical manipulation of the water. 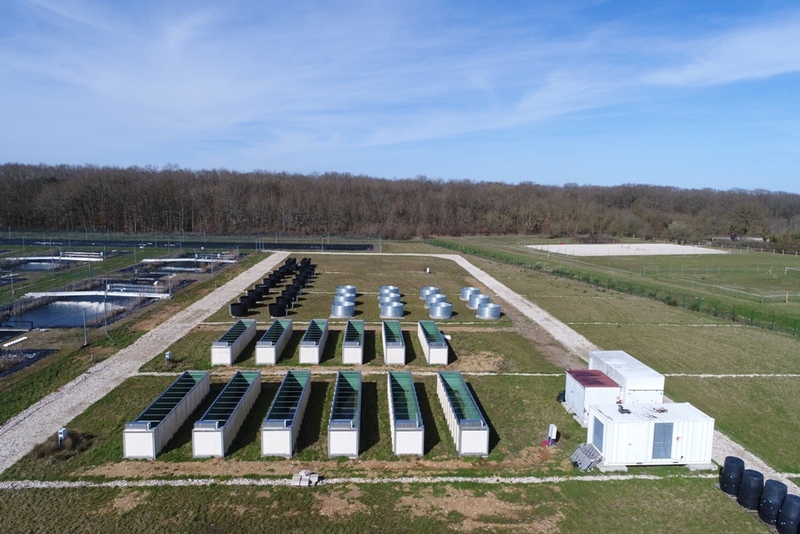 A large number of outdoor mesocosms (more than 60 tanks) different in volume, number and shape are available all year round to develop new studies on stagnant water ecosystems biology and dynamics with a high degree of repetition. Colleagues are also welcome to submit new projects using the series of 12 mesocosms equipped with wave beaters, which are especially thought to investigate the effects of mixing on pelagic and benthic ecosystems. They will be available from June to November 2019 (frost-free season). Researchers can also use in-water mesocoms suspended to a pontoon installed on the stocking lake. Number and size of enclosures are dependent upon the research project and might vary from 16 (V: 22.5 m3) to 450 (V 0.6 m3) enclosures. Transnational Access to users: A total of 150 person days can be allocated to external users involved AQUACOSM Transnational Access provision in 2019. We offer access to 5 persons for 30 days in 2019. The access cost offered by PLANAQUA includes all needed preparatory work (before and at site), as well as specific training needed at the sites to complete the specific projects. International scientists are encouraged to contact the local scientists for propositions (planaqua@biologie.ens.fr, sarah.fiorini@ens.fr). Project 1) The Experimental Lake Platform is available year round for collaboration on an on-going project (2018-2021), titled “New insights on the links between global changes, community structure and ecosystem stability (ECOSTAB)” funded by the French National Research Agency (ANR) leaded by Dr. Elisa Thebault and Dr. Gérard Lacroix. ECOSTAB aims to experimentally test the consequences of eutrophication and loss of top predators on food-web structure and stability of aquatic ecosystems in the experimental lakes of the PLANAQUA platform. Since 2015, half of the 16 artificial lakes (750 m3 each) have been regularly enriched with inorganic phosphorous (KH2PO4) to mimic possible water eutrophication due to anthropogenic activity (urban sewage, agriculture, industry., etc.) compared to natural oligotrophic conditions. In winter 2017, different fish communities of several species with or without big predators (pikes) have been introduced in the lakes in a four-factorial set-up crossed with the nutrient manipulation. The heterogeneity (littoral, pelagic and benthic habitats) and unusually large scale of these experimental systems recreate in this way real-size ecological communities with complex food webs. The main objectives of the ongoing project are to: (i) monitor the main abiotic and biotic parameters and climatic variables of the lakes at fine temporal scales in order to characterize the temporal dynamic community structure and the ecosystem processes. (ii) analyse the effects of nutrient enrichment and top predator loss on the variability of different ecosystem properties (physical/chemical, community responses, and lake metabolism) at different time scales and on the food web topological structure at different seasons. (iii) Investigate the effects of nutrient enrichment and top predator loss on the resistance and resilience of different ecosystem properties to extreme climate events. Every 3 months samples of phytoplankton, zooplankton and micro-zoo-benthos will be identified to the lowest possible taxonomic level, measured for body size and enumerated by microscopy. Macro-invertebrates will be sampled in the three main zones of lakes (lake sediment, littoral areas, and pelagic zones). Periphyton development and dominant pigment classes will be measured by fluorimetry. Fish populations will be accurately estimated using mark-recapture and removal methods. Once a month, we will measure total alkalinity, conductivity, turbidity, dissolved O2, dissolved nutrients: NO2–, NO3–, NH4+, PO4–, N-tot, P-tot, total Chlorophyll a and cyanobacteria, phytoplankton functional pigment groups as well as zooplankton biomass. A large number of outdoor mesocosms (more than 60 tanks) different in volume, number and shape are available all year round from January 2018 (open for TA in the second half of 2018) to develop new studies on stagnant water ecosystems biology and dynamics with a high degree of repetition. Colleagues are also welcome to submit new projects using the series of 12 mesocosms equipped with wave beaters, which are especially thought to investigate the effects of mixing on pelagic and benthic ecosystems. They will be available from June to November 2018 (frost-free season). Researchers can also use in-water mesocoms suspended to a pontoon installed on the stocking lake. Number and size of enclosures are dependent upon the research project and might vary from 16 (V: 22.5 m3) to 288 (V 0.6 m3) enclosures. A total of 150 person days can be allocated to external users involved AQUACOSM Transnational Access provision in 2018. We offer access to 5 persons for 30 days in the second half of 2018. The access cost offered by PLANAQUA includes all needed preparatory work (before and at site), as well as specific training needed at the sites to complete the specific projects. International scientists are encouraged to contact the local scientists for propositions (planaqua@biologie.ens.fr, sarah.fiorini@ens.fr). 1) The Experimental Lake Platform consists of 16 artificial lakes (30 m x 15 m x 3 m deep, 800 m3 each) designed to simulate the spatial heterogeneity and biological complexity of small, continental freshwater bodies (Figure 1). These large experimental systems are spatially structured, with shallow littoral areas, a central pelagic zone and a central benthic area, and may be interconnected along 4 rows of 4 lakes each through 10 m long dispersal channels. In addition, each lake is equipped since June 2016 with automated sensors and data loggers providing detailed and real time information on physical and biological conditions along the water column from the central pelagic zone. The two other artificial reservoirs (126 m x 15 m x 3 m deep, 4000 m3) are a stocking lake used to homogenize water before distribution to experimental lakes and a drainage lake that can collect and purify used water at the end of experiments. 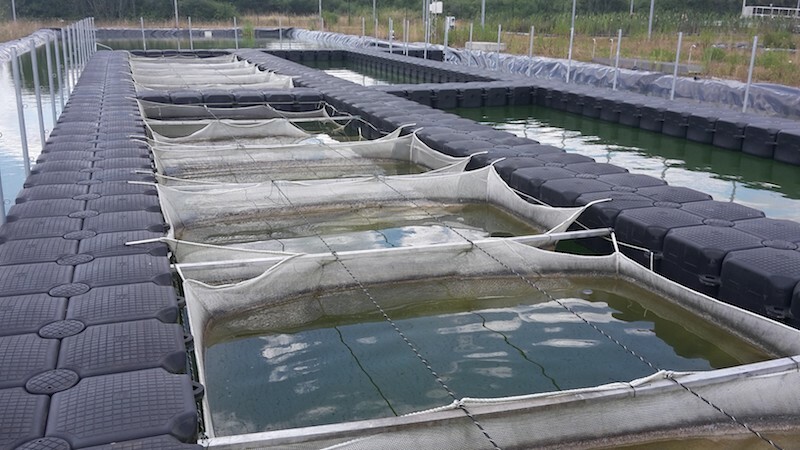 2) Standard outdoor freshwater mesocosms, from 350 litres to 12 m3, with high degree of replication are available (currently, 142 tanks with a minimum of 12 replicates per size group). A further set of 3) 12 outdoor freshwater mesocosms (10 m long, 15 m3) are equipped with wave beaters that generate controlled turbulence and make it possible to manipulate the physical structure of the water column (water mixing) and thermal gradients (see Figure 2 & 3). In addition, 4) standard floating mesocosms (up to 3 m deep, ) can be installed on a permanent floating structure of the stocking lake to run mesocosm experiments requesting a deep and naturally stratified water column (Figure 4). 5) Aquatic microcosms are small containers dedicated to aquatic microbial ecosystems studies from single populations to communities of bacteria, microalgae and other planktonic organisms. Currently, we have in our dedicated laboratories 13 chemostats (single glass vessels) for culturing bacteria and phytoplankton in sterile conditions and 4 double-system chemostats (paired system made out of two connected glass vessels) dedicated to the study of phyto- and zooplankton interactions and dynamics in spatially structured ecosystems (meta-ecosystems). All the systems can be used to run continuous cultures in a light and temperature controlled environment. Moreover, we have 36 custom-made open-top aquatic microcosms dedicated to experimentation on aquatic ecosystems in the Ecolab environmental chambers. Temperature, water mixing and irradiance can be precisely controlled inside each microcosm, and atmospheric conditions are precisely regulated. These equipments are not included in the Aquacosm TA activity but can be directly requested for use to the PI contact. fish presence and abundance, nutrients, waves and water mixing, temperature, irradiance, gas concentrations. 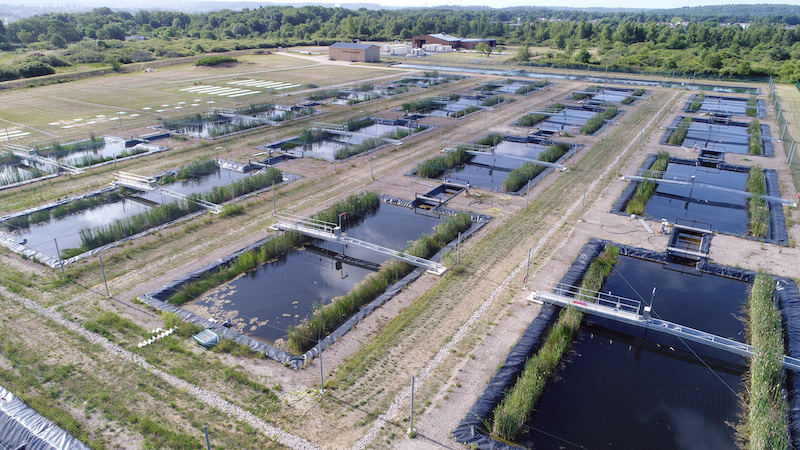 PLANAQUA is a cutting-edge experimental infrastructure located at the CEREEP Research Centre to study shallow lakes ecosystems. Established in 2011 through national funds, PLANAQUA is jointly supported by the Ecole Normale Supérieure (ENS) and the National Centre of Scientific Research (CNRS) in collaboration with the Université Pierre et Marie Curie (UPMC) and the Université Paris Sud (UPS). PLANAQUA was created to explore the effects of human disturbances on aquatic biodiversity, community structure and ecosystem functioning. It combines two types of facilities. The heart of the platform are 16 artificial lakes (30 m x 15 m x 3 m deep, 750 m3 each), with a vegetated littoral zone characterized by silty sediment, a central pelagic zone, and a central benthic area with sandy sediment (Fig. 5). Dispersal channels of 10 m length can interconnect the lakes in groups of 4. All lakes are equipped with automated sensors to measure vertical profiles of temperature, O2, pH, chl a and PAR. Data are stored on a central database server (Fig. 6). Two larger lakes (126 m x 15 m x 3 m deep, 4000 m3 volume) are intended to serve as a storage reservoir for species (for stocking purposes) and water (to ensure a homogenous quality of water distributed to the experimental lakes) or as a drainage reservoir, respectively, to receive water from the lakes after an experiment (Fig. 1). The first lake can also be used to suspend enclosures attached to a floating pontoon (Fig. 4). They can range from 8 enclosures with a volume of 22.5 m3 each to 144 enclosures holding 0.6 m3 of water. Additionally, the experimental lakes are complemented by 142 outdoor mesocosms of various sizes and shapes (Fig. 2, detailed documentation available on demand and on our website). Among them, 12 mesocosms, with a capacity of 15 m3, each have wave generators to control water turbulence and movable lids to control thermal gradients (Fig. 3). Instruments and equipment available in the labs include flow cytometer, autoanalyzer, spectrophotometer, growth cabinets, laminar flow hood, fume hood, -20°C and -80°C freezers, autoclave, oven, liquid nitrogen, distilled and ultrapure water, microscopes, centrifuge, precision balances, algae culture facilities, FlowCAM, etc. Field equipment includes small boats, samplers, physical sensors, multi-parameters probes, BBE fluorimetric probes, BBE benthotorch, etc. Some experiments with fish may also be conducted in a fish house. A biometry station is available to tag and automatically record morphological data of fishes. At least 450 person-days in total will be allocated to external users through AQUACOSM Transnational Access provision in years 2-4. Users will be encouraged to apply for AQUACOSM support particularly to cooperate in an ongoing long-term experiment (>4 years) to assess the importance of bottom-up and top-down control of complex communities in a spatially structured habitat. To that end, half of the 16 lakes have been progressively fertilized since 2015, and fish communities will be added in a full factorial design in the autumn of 2016. Users interested in participating in this experiment are most welcome. However, efforts will be made to accommodate also independent experiments that could either be integrated into the ongoing project. 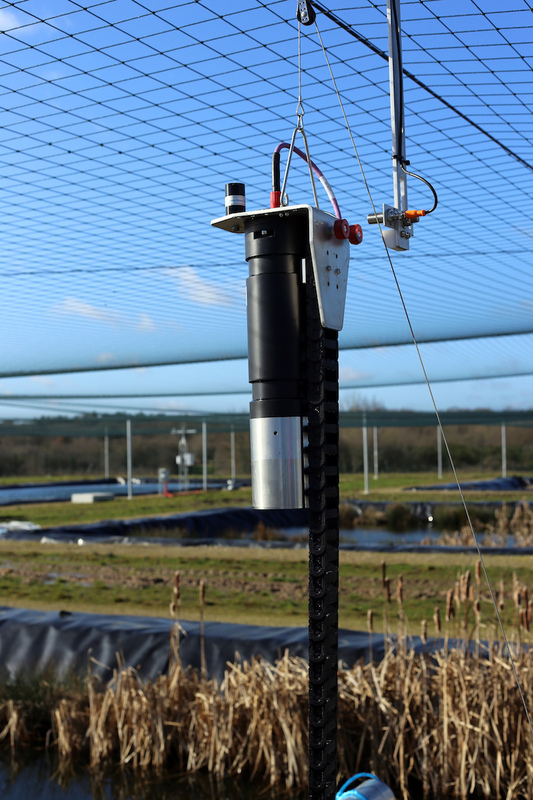 Mesocosms offered by PLANAQUA are freely available for guest researchers to develop their own projects. Access is offered to at least 5 persons for 30 days each year. Services currently offered by the infrastructure: The PLANAQUA platform is open to researchers and private companies around the world. Users have access to the range of laboratories and equipments, instrumentation and data, office space, dormitories and lodging facilities at the CEREEP. CEREEP – Ecotron Ile de France is able to host up to 36 sleeping guests (12 double rooms and a dormitory for students). In addition, through cooperation with the laboratories associated in the PLANAQUA project, the infrastructure may favour collaboration with other laboratories in Ile-de-France and access to other facilities. PLANAQUA is a member of the national infrastructure AnaEE France dedicated to experimentation on ecosystems. All submitted projects must be registered in the data base of projects of this national infrastructure and users will have to agree with our user charter and publication policy. Details available at http://isia-cereep.anaee-france.fr/ and on request.